Over at Spiral Whisper there is some exciting new things happening. First up is Stamp of the Week, this happens every Monday. The stamp can be purchased from Spiral Whisper at a special price for one week only. The stamp this week is the very cute Princess Meg designed by Janet Roberts. I have stamped Princess Meg out and and coloured her in with watercolour pencils and added glitter to her crown with my Spica pen and have gone over her nose with my Sakura Glaze pen. I have then cut her out and mounted to Lilac CS and added to base with 3D foam pads. The base has been made by simply layering up Lilac CS and Doodlebug paper on to a white card blank. I have printed the greeting from my PC (Dreamed About You font used), mounted to more Lilac CS and rounded two corners. Gem stones added to the message panel and the crown to finish. STAMPS: Spiral Whisper. INK: VersaFine Onyx Black. CS: Papermania, Doodlebug Designs. ACCESSORIES: Papermania Adhesive Gems, Copic Spica At You glitter pen, Woodware corner rounder punch, Sakura Glaze pen. 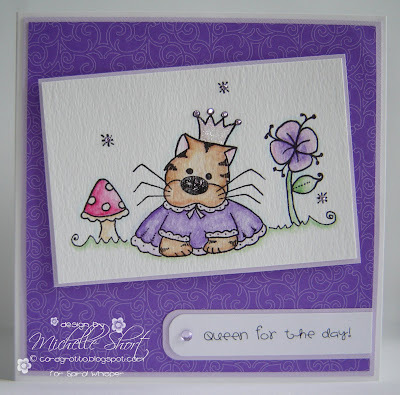 Head over to the Spiral Whisper Blog now to see the great cards the other DT members have created with Princess Meg and to check out the competition they are holding. Of course you have to head over to the shop too where all the new releases are at! I would also like to welcome Frances aka StampOwl as September Guest Designer, have YOU applied for the upcoming months? This is really pretty Michelle. Loving the purples! The image is beautifully coloured and very cute! Awww this is a real cutey Michelle. Love the colouring and the sparkly bits. Off to check the goodies out now! (What font did you use for the message. Don't think I've got that one)? stunning card as always Michelle, can you tell me what font that it you use on your pc its gorgeous. What a cute image. will head over n ow to see what other goodies SW has.